Praise be to Allah, Who brings glory to the believers, humiliation to the tyrants, disgrace to the Kuffar and the hypocrites, and prayers and peace be upon the Messenger sent as a mercy to the worlds, the Imam of the pious, the leader of the noble and pure, our master and our beloved, and the comfort of our eyes, Muhammad Ibn Abdullah, prayers and peace upon him, his family and those who follow him..
Then we were satisfied with the republican system; be it a dictatorship or a democratic one, the result is one. It is ruling by that which Allah did not reveal and the exclusion of the rules of Allah which came in His Book and the Sunnah of His Messenger ﷺ. We accepted to be torn apart into cartoon states, where every group of Muslims are happy with their patriotism; we were covered with humiliation and disgrace, and we became at the tail of the nations after we were their leaders and masters when we had the Khilafah state, which its constitution was the Book of Allah and the Sunnah of the Messenger. Its banner was Al-U’qab, the banner of Muhammad the Messenger of Allah ﷺ, the banner of La Illaha ila Allah, Muhammad Rasool Allah; the Khilafah that brings people out of the darkness of kuffr to the light of Islam and justice by the permission of its Lord. What the Khilafah scouts presented today, which you witnessed and interacted with, comes within the framework of the events of the 97th anniversary of the destruction of the Khilafah (Caliphate). It is heartwarming and a comfort to the eyes. It motivates men and women to work hard to revive the Islamic way of life by establishing the second rightly guided Khilafah on the method of the Prophethood. Their presentations filled our hearts with enthusiasm, and highlighted the humiliating and dire situation of the Ummah as a result of the absence of the Khilafah and its shield, the Imam. 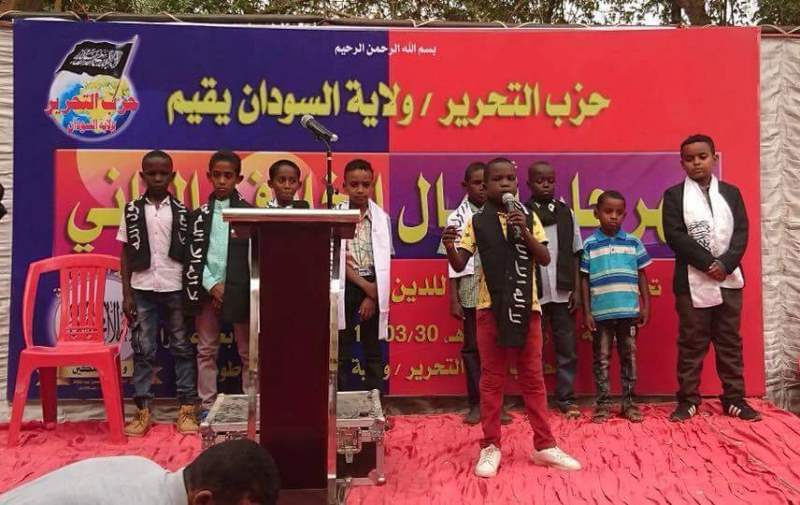 The children, interacting with the vital issues of the Ummah, stirring up our emotions, awakening the minds and souls, send messages to the Ummah’s scholars, heirs of the prophets, to stand with the truth and support the Dawah carriers for the resumption of Islamic way of life by the establishment of the second rightly guided Khilafah on the method of Prophethood. And they send messages to the people of power and support to support the workers to restore the rightly guided Khilafah on the method of Prophethood that will bring glory to Islam and its people and humiliates Kufr and its people. And a last call to the Islamic Ummah; that each group in it and each individual should carry out his Shariah duty so that Allah crown everyone’s efforts with victory and empowerment, Allah promised His believing slaves the Khilafah and the empowerment. He (swt): وَعَدَ اللَّهُ الَّذِينَ آمَنُوا مِنْكُمْ وَعَمِلُوا الصَّالِحَاتِ لَيَسْتَخْلِفَنَّهُمْ فِي الأَرْضِ كَمَا اسْتَخْلَفَ الَّذِينَ مِنْ قَبْلِهِمْ وَلَيُمَكِّنَنَّ لَهُمْ دِينَهُمُ الَّذِي ارْتَضَى لَهُمْ وَلَيُبَدِّلَنَّهُمْ مِنْ بَعْدِ خَوْفِهِمْ أَمْنًا يَعْبُدُونَنِي لَا يُشْرِكُونَ بِي شَيْئًا وَمَنْ كَفَرَ بَعْدَ ذَلِكَ فَأُولَئِكَ هُمُ الْفَاسِقُونَ “Allah has promised those who have believed among you and done righteous deeds that He will surely grant them succession [to authority] upon the earth just as He granted it to those before them and that He will surely establish for them [therein] their religion which He has preferred for them and that He will surely substitute for them, after their fear, security, [for] they worship Me, not associating anything with Me. But whoever disbelieves after that – then those are the defiantly disobedient” [An-Nur: 55]. To the glory of this world, and greater than this, to the pleasure of Allah, we invite you. Wassalam Alaikum Wa Rahmatullah Wa Barakatuh.